Honkogetsu embodies the Japanese aesthetic, infusing its goodness into cuisine, tableware and setting, showcasing ingredients you may have never heard of before thanks to the creative mastery of Chef Anami. Despite being just six years away from his 75th birthday, which he suggests could be the goal in his chef career, Anami continues to show the talent and flair that has endeared so many to his kaiseki cuisine. Get there sooner rather than later to be sure you don’t miss the look, feel, and taste of Japan as seen through this master’s lens. Not far from Nanba and the busy Dotonbori district of Osaka is a tiny alley leading to a famous temple called Hozenji Yokocho. 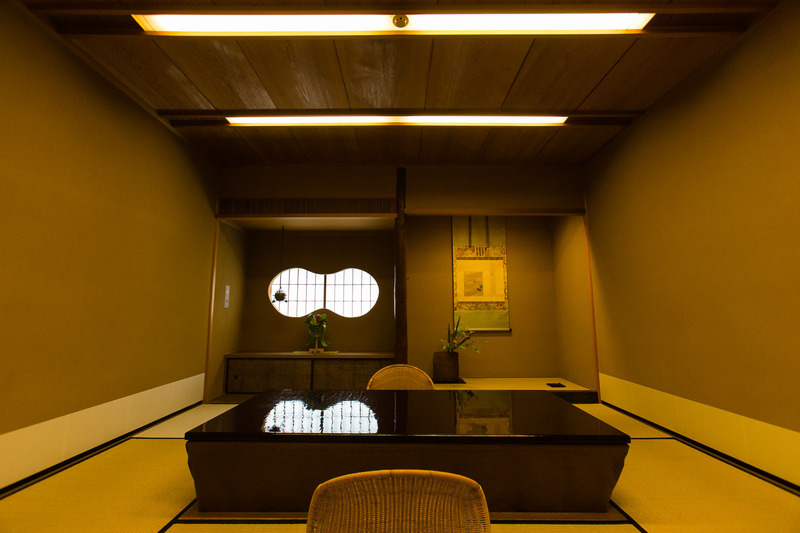 Lined with shops, bars and restaurants, the secluded cobblestone street offers a glimpse of Osaka in days gone by, and it is here that you will be greeted by the elegant and austere beauty of a traditional tea house. 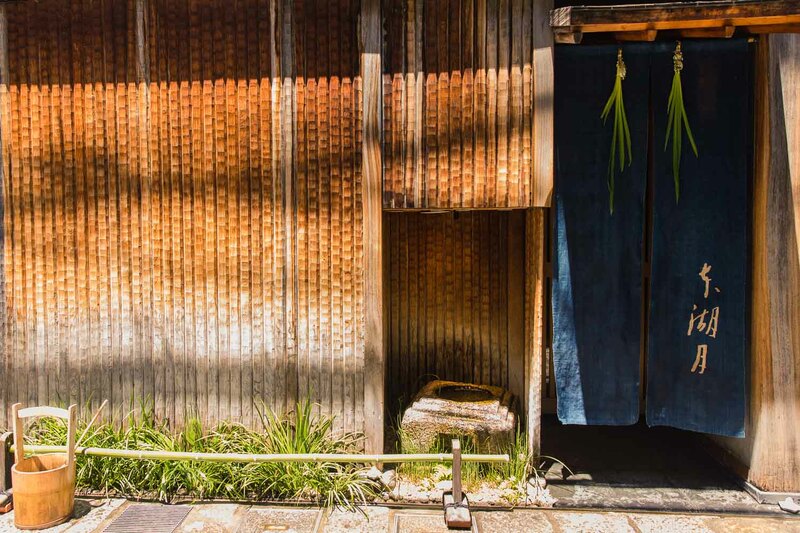 Built in the sukiya tea house architectural style, the soft orange light at the entrance mimics that of Hozenji Temple’s picturesque lanterns, and a few bamboo leaves overhang the entrance. From soil, wood and washi Japanese paper to the paints made entirely from urushi lacquer, everything you see around you comes from nature. The grand building is three stories tall with an underground floor storing all the restaurant’s tableware, which Chef Anami respectfully refers to as his ‘tools’. Anami has made this place his base since 1974, when at the age of 25 he became its head chef. He later assumed ownership and changed the name from Kogetsu to Honkogetsu and continued serving his incredible cuisine until the entire restaurant burned down as the result of a devastating fire at Hozenji Temple. No expense was spared in its reconstruction in 2006: the first-floor counter is a solid plank of 600-year-old hinoki – an incredibly rare piece of timber. The very sight of it motivates Chef Anami, reminding him of his own promise to always serve cuisine that pays homage to this great object of nature. 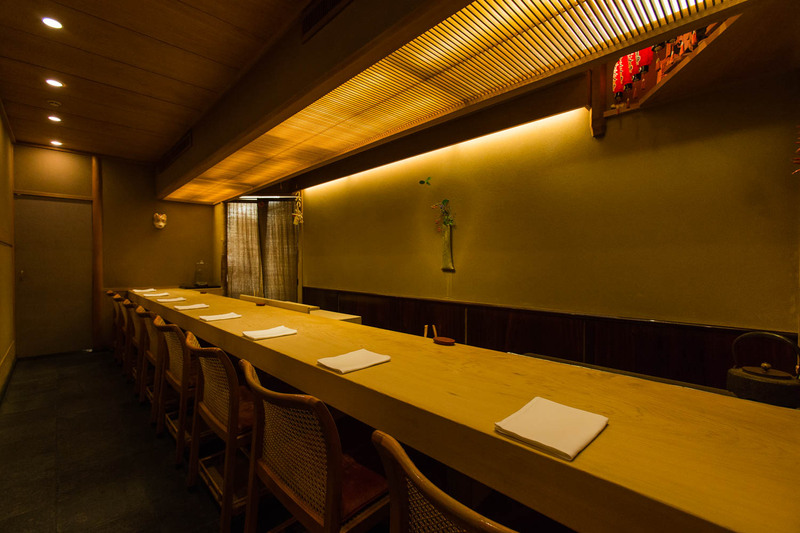 The second and third floors offer traditional tatami mat-seating in spaces thoughtfully accented by hanging scrolls and methodically arranged ikebana flower displays. While staying true to the tenets and flow of traditional tea ceremony cuisine, known as cha-kaiseki, Chef Anami shares his authentic style in a flawless display of the shifting seasons through his delicious morsels, breathtaking tableware, and awe-inspiring setting. His masterful expression of Japanese cuisine will surely capture your heart, as it has for so many who have dined here before you. The true pleasure of Honkogetsu is more than just the delicious food: it is found in the complete experience of the season. A desire to revel in the goodness that each season offers will draw you back to Honkogetsu time and again. Using only the finest domestic Japanese ingredients, Anami is driven by a desire to perfectly highlight each item’s splendor in a course which oozes tradition without feeling the least bit dated. And as Japanese cuisine is eaten with chopsticks, he is constantly aware of creating bites than can be gracefully carried to the diners’ lips. In a monthly seasonal menu of eleven to twelve courses, each stunning dish is infused with the beauty of Japanese culture and deep yet elegant flavors. They draw you into that moment and that season and captivate you with their stunning and skillful plating. In fact, the season will present itself to you from the moment your meal begins, in the welcome sip of sake – the gentle cloudy hue of white sake in March, a floating sakura cherry blossom in April, and in May, infused with the soft fragrance of irises. 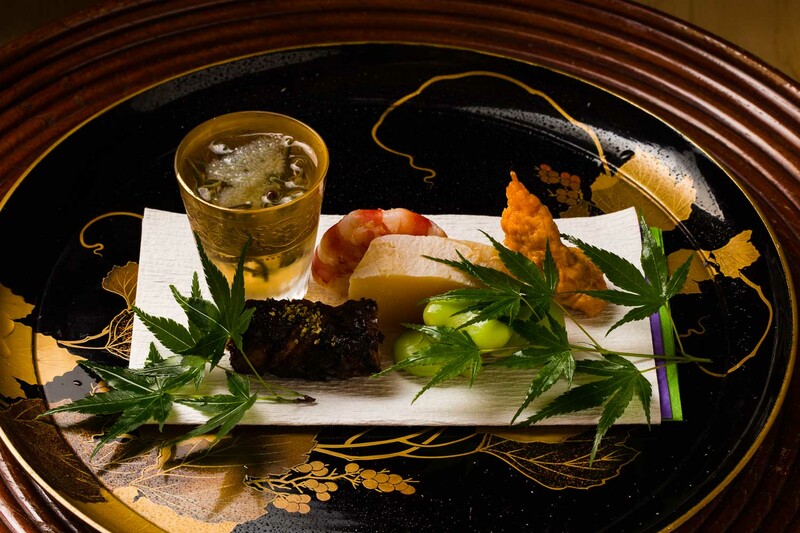 An appetizer of kegani hairy crab from Funka Bay in Hokkaido topped with vinegared dashi gelee is plated within an emerald green square bowl by the tenth-generation master of Raku ware, a pottery tradition which began in Kyoto in the 16th century. Incorporating the seasonal flower, the striking leaves of an iris appear as a sharp sword. A black lidded lacquerware bowl arrives. 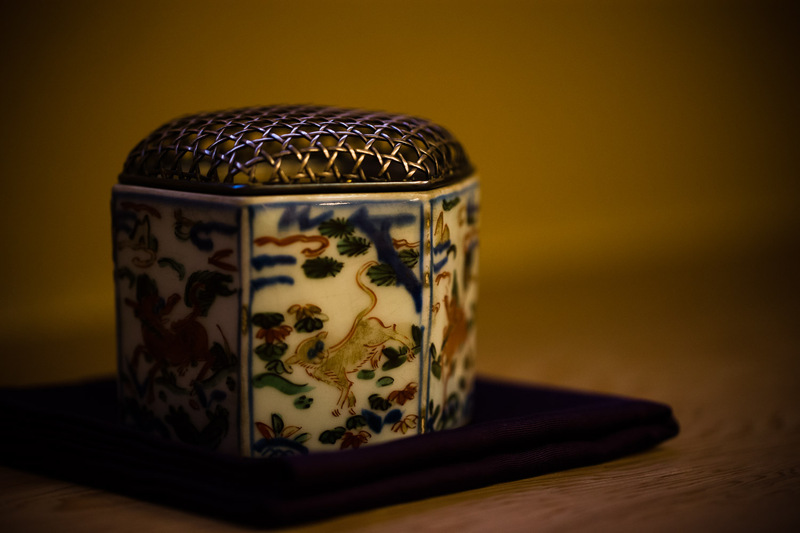 You remove the lid to reveal an intricate golden design within and learn that this stunning bowl is approximately 100 years old, having been made in the late Meiji Period. It is the perfect canvas for a plump piece of fat greenling fish nestled beside a rectangle of smooth green bean puree floating in a crystal clear warm broth wafting of yuzu. The green bean puree is set using Yoshino kudzu – the finest Japanese gelling agent, providing a texture sensation not possible with any other starch. 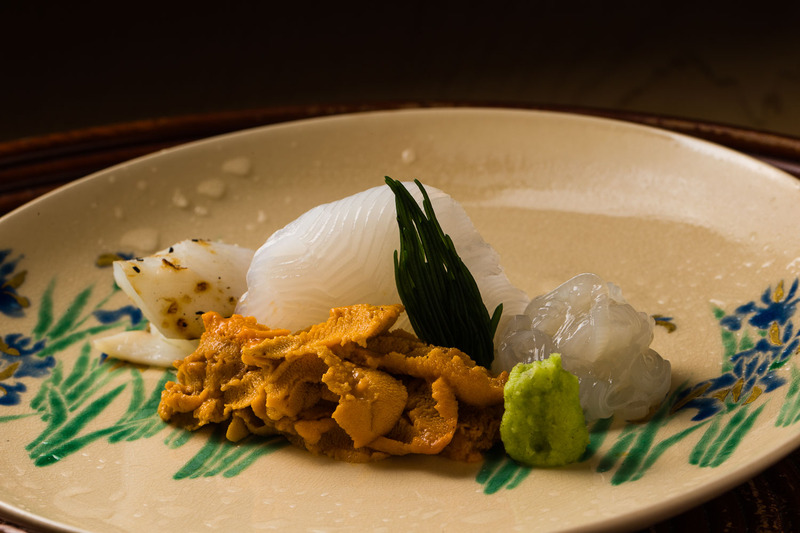 The otsukuri, or sashimi platter features Awaji sea urchin alongside tachiika oval squid from the Seto Inland Sea served three ways: charred squid legs, fresh flesh, and engawa – a delicious treat from the edge of the squid. The diner is free to enjoy the sashimi with either seaweed salt called mojio from Hiroshima or soy sauce from Ehime Prefecture. 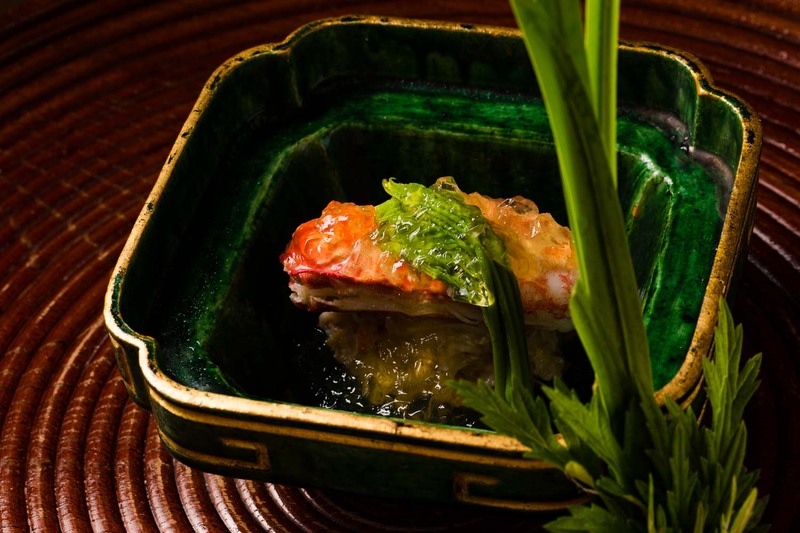 The hassun, a dish that brings together seasonal ingredients from the mountains and sea in an incredibly artistic display, showcases a large prawn and the prized ingredient of the dried ovary of a sea cucumber. 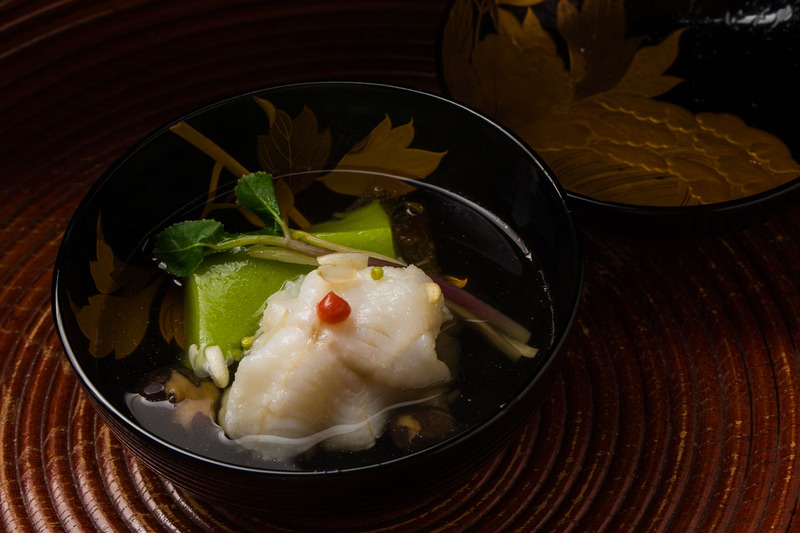 These sea delicacies are presented alongside bamboo shoot, fava beans and the simultaneously slippery and crunchy texture of watershield plant, called junsai in Japanese. This is followed by the grilled course of chiayu young sweetfish from Lake Biwa, served with a refreshing traditional vinegar made from the pungent leaves of the water pepper plant. The fish appear to be swimming playfully together along the narrow platter they are presented upon. Osaka has long been referred to as Japan’s kitchen. While incorporating many local ingredients, Anami also challenges himself to use unfamiliar products. But make no mistake, nothing makes its way onto the dishes at Honkogetsu simply because it is trendy: you will never find butter or olive oil here. Even Japanese guests and seasoned kaiseki gourmands will discover new foods every time they dine at Honkogetsu, such as a plant with tiny red berries called arbutus, or shoro, an edible mushroom commonly referred to as ‘false truffles’. Anami’s efforts in this regard were rewarded in 2012 with the Ryori Masters Bronze Award from the Ministry of Agriculture, Forestry and Fisheries, through a system commending chefs making major contributions to primary industry as they popularize Japanese ingredients and culinary culture. Hideo Anami was born in Fukuoka Prefecture in 1949. He joined a Japanese restaurant in Osaka at just 16 years old, and at age 19 he was in charge of in-flight meals for Japan Airlines based out of Paris, France. On his return to Japan, he worked at Koraibashi Kitcho Honten until 1974 when he took on the head chef role at Kogetsu at the age of 25. Taking ownership of the restaurant in 1994, Anami found his independence and started afresh with the new restaurant name Honkogetsu. With utmost respect for Japan’s incredible array of ingredients, guests are charmed by Anami’s delicious dishes, which speak of the seasons like a haiku poet’s almanac of seasonal terms. Even though he sees the same seasonal ingredients year after year, he is constantly thinking how best to present them and constantly searching for the perfect ways to share authentic Japanese culture through his cuisine. Despite being a veteran revered in the Japanese culinary world, he still talks of the need for personal growth to keep pace with his incredible guests. Everything you see around you at Honkogetsu is from Anami’s personal collection — a lifetime of investment that he says is “half business and half pleasure”. 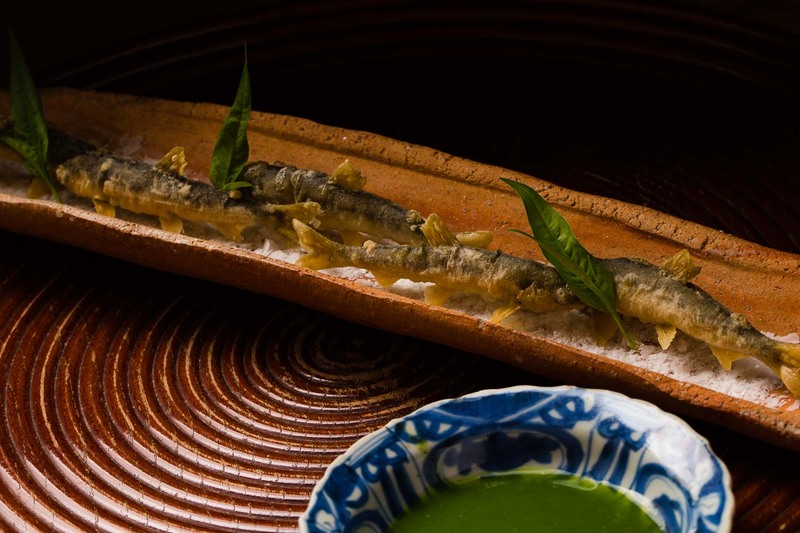 Anami uses his food as a canvas for expression of gratitude for the time and effort expended by guests who travel from around Japan or overseas to visit his restaurant. He invests all his energy in giving them a true sense of the splendor of Japan through his cuisine, tableware and ambience. A testament to his ability to continue to please can be see in the anecdote of one couple from Hokkaido. Every month for the past 20 years they have traveled from Japan’s north island to take their place in this historic restaurant, unable to resist the temptation of Honkogetsu’s monthly-changing seasonal menu. During his holidays each year, Anami visits the snowy Alps of Europe with his wife. Their days are filled with skiing and local delicacies alongside rare champagnes and wines, some of which can be enjoyed at Honkogetsu. Chef Anami’s vision is simple: that through their work, he and everyone around him may find happiness. The kitchen at Honkogetsu is supported by five long-term apprentices including some who have been there for 10 and even 20 years. Anami’s wish is that they may all go out on their own at some point to start their own restaurants. He wants the chefs of the future to share authentic Japanese cuisine like he always has. The 69-year-old jokes about his goal as a chef being the 75-year mark, but realistically he takes one year at a time hoping to always continue in this way. He also thinks seriously about how to best convey the value of Japanese cuisine and improve recognition for its chefs, saying a system of cultural medals should be established to reward exceptional service in the Japanese culinary world. 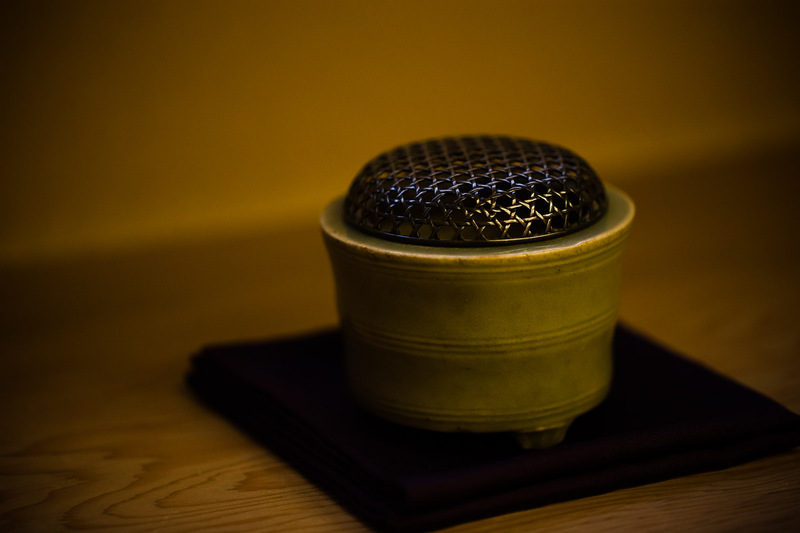 Aromas are essential to Japanese cuisine, and a restaurant’s particularity can even be understood from the style of incense burner they use. An antique wooden stacking box is removed to reveal an array of incense burners from which Anami chooses the perfect one for the season, in keeping with the hanging scrolls and other accoutrements in each room. The incense is set to burn calculating backwards from each party’s expected arrival time, as guests should be greeted with a lingering seasonal fragrance. The incense is burned carefully once again to time with the closing dish of the course – the rice. The fragrance must not confront or interfere with the delicate aromas emerging from the cuisine when a guest removes the lid on a bowl of inviting dashi or the appetite-whetting aromas when the grilled dish arrives. Next time you visit a Japanese haute cuisine restaurant, be sure to leave the perfume at home and enjoy the thoughtfully-placed, heady aromas of seasonal incense.